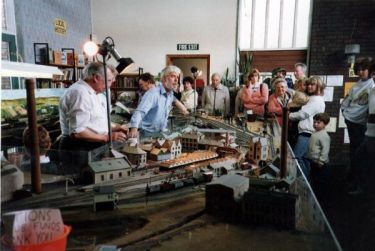 This page shows a couple of pictures from when Ramsbottom Model Railway Club were invited to attend the openday at Ramsbottom Library in on a Bank Holiday in 1991. 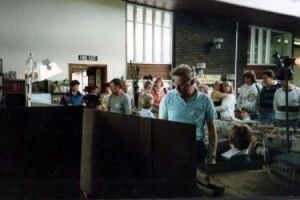 All pictures are copyright to Ramsbottom Heritage Society. Members present on this day were Roy Clarkson, Harry Dennis, Alan Garside and Ray Price. This photograph is taken from the cricket club on the layout and is looking across to Ramsbottom Station. Members shown from L-R are Roy Clarkson, Ray Price and Alan Garside. 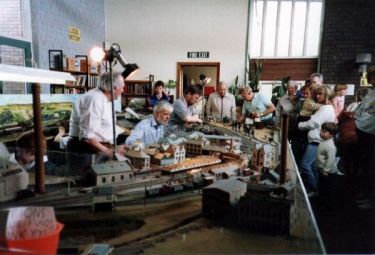 This photograph is taken from the Nuttall Tunnel near the rear of the layout looking across to the front. Members shown from L-R are Alan Garside, Ray Price and Harry Dennis.